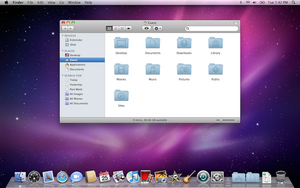 Screenshot of Mac OS X v10.6 "Snow Leopard"
See platforms for an overview over the supported devices and CPUs. 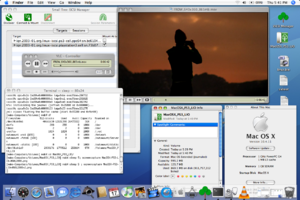 MacOSX iSCSI on a TiBook G4 connected to a PS3 playing QuickTime video over Ethernet. MacOSX iSCSI on a TiBook G4 connected to different LIO architectures, watching iSCSI/DVD. Apple Mac OS X is a series of Unix-based operating systems and graphical user interfaces developed, marketed, and sold by Apple Inc. Since 2002, Mac OS X has been included with all new Macintosh computer systems. It is the successor to Mac OS 9, released in 1999, the final release of the "classic" Mac OS, which had been Apple's primary operating system since 1984. OS X with the SmallTree iSCSI Initiator v0.6.8 can connect to LinuxIOs. Using this Initiator with LIO requires at least LIO v2.9-STABLE r301. 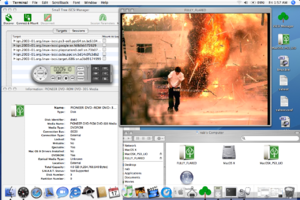 The Initiator has first been tested on Mac OS X 10.4.8 in VMware Workstation 6, and in Mac OS X on a PowerBook G4 Tibook, and has since been stable and supported by SmallTree. To get LIO setup quickly with using VMs, see LIO-VM. Inside of the VM, filesystems can be created using Disk Utility, they can be mounted, files can be copied in and out, and our testing showed no problems. Read-only mounts from Mac OS X formatted filesystems in Linux/iSCSI Initiators VMs using the hfsplus filesystem also works. As HFS is not a cluster filesystem, use great care when accessing a single hfs mount with R/W and multiple iSCSI Initiators. The following tests scenarios have been evaluated so far. TYPE_DISK: Works, audio/video playback is stable with VLC. TYPE_ROM: The TiBook crashes with DVD Player Optical drive access to the PS3, LIO-VM from the x86 Macbook Pro and G4 Cube. However, an old Parallel SCSI DVD-ROM is playing stable from i386 Linux. Leopard seems still a bit weak when accessing these optical drives. Also, VLC can play VOB files for pre-Leopard cases. ↑ "Apple Developer: Cocoa Overview". Apple Inc.
↑ "Apple Developer: Mac OS X Technology Overview". Apple Inc.
↑ "Mac OS X 10.5 on Intel-based Macintosh computers". The Open Group. ↑ "Mac OS X 10.6 on Intel-based Macintosh computers". The Open Group. ↑ "Apple page on UNIX". Apple Inc.
↑ "What is an operating system (OS)?". Apple Inc. 7/15/2004. This page was last modified on 29 September 2013, at 20:58.